The best thing about the new crop of LED headlights on cars is that they increase visibility so much compared to standard halogen headlight bulbs. The worst thing about them is that they’re typically found on either expensive luxury cars, or they’re an expensive option on regular cars. 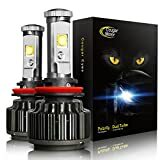 But why buy a $1,500 package that includes LED headlights when you can buy the CougarMotor LED Headlight Bulbs All-in-One Conversion Kit for just $44? It comes in every bulb size so it works in any car, and it only takes about 15 minutes to install even if you have no experience working on cars. HIGH POWER: Top CREE LED chips with 60W per pair. Cool White 6000K. High luminous efficacy Flux Up to 7200LM per pair. 200% brighter than your stock Halogen headlights.The latest technology to ensure a perfect beam pattern without any dark spots or foggy light. EASY INSTALLATION: Can be installed in 20 mins. plug and play. These bulbs are CanBUS-Ready and will work with most vehicle’s computer system without error. If you are not sure whether the right, please contact us before purchase. LONGER LIFE: Last more than 50,000 Hours. Works underwater! Rainproof driver, housing, and fan works even in extreme situations. WARRANTY: Buy with confidence.We offer 3 year warranty and lifetime support.